Someday I'll Sleep Autism Blogs: Theme Thursday: Play! When I saw that today's Theme Thursday theme was play this picture came to mind and I just had to use it. 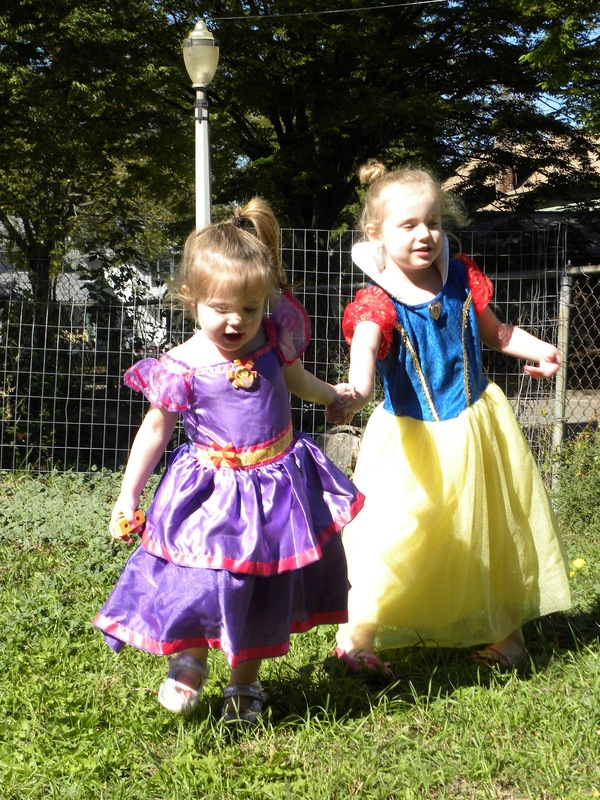 This was a spinning, running, jumping hand holding day for the girls... and all while playing princesses. Poor Patrick has big expectations to live up to. His sisters have already cast him in the part of prince. Yesterday I heard Sadie kneeling next to him saying: "Hello Prince! You're so handsome and... young!" Today's theme got me thinking about a part of the girls doctors appointment paperwork that left me confused, because I had no idea the actual answer. They asked me to quantify how many hours of "play" my kids get a day. I sat, staring at the question. I have no idea of the actual answer. How much do my kids play a day? How many hours are they awake? I thought in response. They play like it's a full time job (and it pretty much is). Right now Sadie is sprinting back and forth across the room. Sometimes (okay almost every day) I hear them playing for a couple hours after bedtime. I'll hear jumping and giggling and squealing and singing. Sometimes I go upstairs and say: "Girls, it's time to sleep!" just to hear the hysterical giggling that inevitably follows those words. Eventually they tumble into their beds and close their eyes, half under the covers, sound asleep. They play inside and outside. They hold hands and twirl and jump off the bottom stair and skip across the living room. At times I've caught Mae dancing on the dining room table. I finally wrote 6+ hours, thinking the answer was heavy on the plus. The actual answer is probably more like 12+ hours if you count all the bed jumping post-bedtime play. Today it will be much, much lower because we're all sick and mediated and sitting on the couch together wishing it wasn't finals week and staring blankly at the TV thinking about how not fun being sick is. Head over to Clan Donaldson for more Theme Thursday posts! Oh and if you have a moment say a prayer for Paul who has two law school finals today. He left long before the sun came up this morning to continue his near constant studying and I believe the first one starts in ten minutes! wHAT A SILLY QUESTION FROM THE DOCTOR'S OFFICE. Oh didn't mean to yell - caps lock. Even if they go to preschool, they still play practically all day. I don't quite get the point of that question. Maybe they meant play as in outside/exercise? Good luck to your husband this morning! Adorable photo and my two year old son with two big sissies has been playing prince since birth. What a strange question...maybe they meant unstructured play? Huh. My guess is that they are looking for those kids who park in front of a TV all day. Doctor's offices are just nosy. The kid is sitting in front of them, clearly well fed, muscular, energetic, conversational, confident, even pushy, bright, lightly tanned, dancing around the exam room, climbing anything they can get a toe hold on, etc., everything we like our children to be-- so what more do they NEED? For nosy questions, I just don't answer or, like with income questions, I give a truthful but non-committal response, like, "not nearly so much as I would like!" Childhood obesity has doubled since we were kids, so they like to be sure that we're keeping our kids busy. Your princesses make me smile. We finally have our little girl and I caught the Mr looking for princess costumes already. Absolutely love the princess dresses. I am making a Rapunzel dress for my 3 year old granddaughter for her birthday. I remember my husband taking his law school finals 34 years ago and then taking the bar just weeks later. A very hard time of life for sure. Come over and visit me ! I agree on the oddness/nosiness of the question. But, more importantly, look at your princessess! Adorable! Reading all your doctor's office updates this week has gotten me all kinds of frustrated with that practice. They are out of touch!